Vinyl has scratches, Cover has masking tape residue on spine, masking taped top seam. Numerous scuffs and scratches on both sides. Plays VG on my system considering these defects. Numerous pops clicks and surface noise throughout. Label is spindle marked but still looks good. Cover is shelf worn and shows a 5in split on bottom seam. Spine is in good shape but Corners are all damaged. Some ring ware and staining especially noticed on the rear cover. Mouth Warren. Generic white paper sleeve. No cover, and the label is scratched. The record has several visual marks. Two skips, quite a few clicks and bops and crackle and surface noise during some sections. Plays better than it looks. Signs of wear, surface noise doesn't overpower music, very listenable. RVG, "Ear", 47 west 63rd on both sides of label. Laminated cover has 4" split on bottom, small tape on spine/shelf/edge wear, WOC. Surface noise, pops and cracks throughout records (especially on quiet moments and inbetween tracks) although not overwhelming. Plays throughout without any skips. demander des photos. premier pressage sans le petit R..un original..en très bon état d'écoute.pas de saut..des craquement oui..mais le son et bon. Light scuffs, no deep scratches. Some surface noise and clicks here and there but still very listenable. No skips guaranteed. Cover is torn and taped. One of my absolute favorite jazz albums. deep groove 65rd st pressing with RVG, ear, and 9M. surface noise present, but not overpowering. sleeve is glossy with some edge wear; nothing serious. 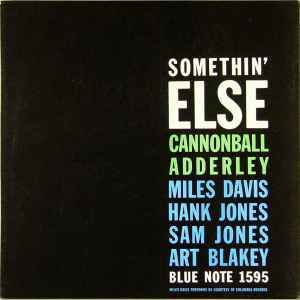 Record: Label Side A: Blue Note Records (no INC) 47 West 63rd, (no ®), Deep Groove. Runout: BN-LP-1595-A, 9M, RVG, ”P”. Label side 2: Blue Note Records INC 47 West 63rd, ®, Deep Groove. Runout: BN-LP-1595-B, 9M, RVG, ”P”. Vinyl: Visually some superficial marks, but plays very well (Strong VG). Sleeve: Gloss laminated sleeve, 5 inch lower seam split + some fragments of seam worn. Back cover adress: Blue Note Inc, 47 West 63rd St (Strong VG). Conservatively graded. BN-LP-1595-A/B, RVG, 9M, P (ear) US mono original, Deep groove on both sides, Rare! Side One: "Blue Note Records INC" and "R" Side Two: "Blue Note Records" No INC and "R"
Side one VG+ and only a few marks on the second side, mostly from inner sleeve, probably. Some wear around the sleeve's edges and discoloration on rear. PLEASE NOTE: THIS ITEM MUST BE SHIPPED WITH INSURANCE WHICH WE WILL COVER FOR UNITED STATES DELIVERY. INTERNATIONAL POSTAGE MUST BE SENT REGISTERED WITH INSURANCE PAID BY BUYER. Deep groove OG pressing, has marks but sounds great. Cover still laminated, all edges solid, great shape, light browning on the back. No skips, but definitely some warmth, and muffled pops; certainly "has the character" of a gently used vinyl record, but plays back very well. Noise does not overpower the overall sound of the music. Visually with some loss of luster and several visible but light surface scratches. Play grading as we are typing without any skips or problems on our Thorens but with some background but solid VG+ in sound quality. Label of Side 2 is Missing (peeled off). Jacket is VG because of some clear tape spot over somethin' and some mended seams done with some clear tape as well. The rear of the jacket has small signature next to "High Fidelity". Pictures only to serious buyers. US original! 47 West, van gelder, no (r). A really great copy! Record is visually VG with many light lines but plays great, at least VG+!! Cover has creases and edgewear, nothing major, VG+! Great spine! Cover - Thumb size piece of clear tape top right corner. 3" clear tape lower right seam. Nice spine. lower seam wear. pics available. Record - DG, RVG & "ear" no R. A few very small pressing bumps. One ticks for two rotations inbetween tracks. Daddy-O/Dancing In the Dark. Great fidelity.